Crisp weather (some days), the smell of fireplaces burning, and twinkling lights all indicate the holiday season has arrived. 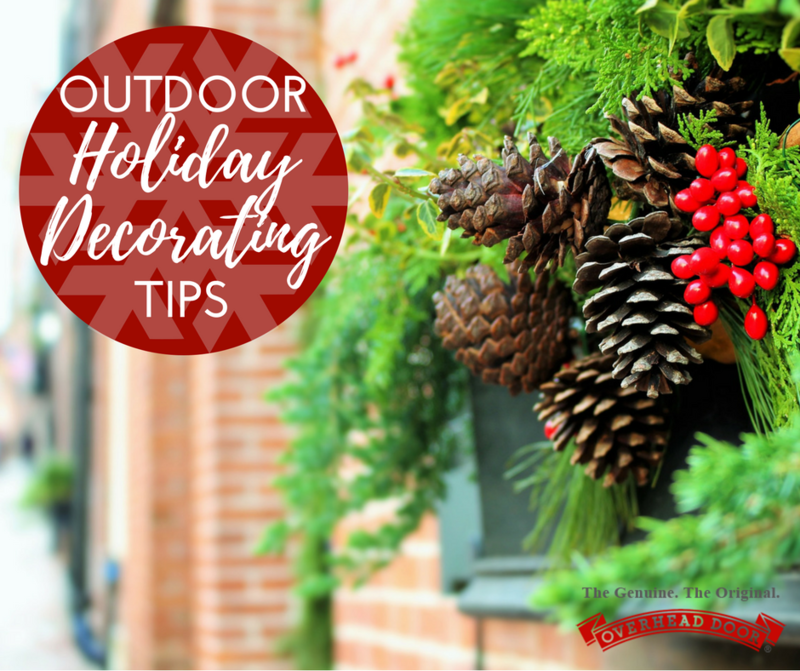 Though you’ve probably already done some decorating for the festivities, we’re sharing a few outdoor holiday decorating tips that will help keep you safe and merry! Some light strings can be implemented for indoor and outdoor use. However, if you’re planning to decorate outside, be sure that those lights are suitable to be use outdoors – they’ve been tested to withstand wet, cold weather. It’s all a matter of safety when it comes to using the right lights. Though we don’t have to worry about ice and snow as often as other parts of the country, be sure to keep outdoor decorations away from pathways. These can include driveways, sidewalks, and other entries. Though we encourage holiday cheer, creating an obstacle course can reduce visibility and cause injury. It would be a shame for the package delivery person to trip over a reindeer! If you plan to add décor to your garage door, be sure to secure it in a place free of moving parts. Garlands and wreaths can easily get caught in the chains, causing damage to your garage door. Additionally, be sure to keep decorations away from moving vehicles, so they don’t get tangled in tires or axles. If you do, know that Overhead Door is always available to help. Make sure that your outdoor outlets are safely grounded and protected from moisture. It’s critical to prevent sparks and fire hazards. Additionally, be sure that no power cords are strung so tightly that could cause someone to trip over them. It’s also important that you don’t overload outlets with too many decorations. If you plan to do this, be sure to purchase a heavy-duty outdoor-friendly power charger. What are your favorite holiday safety tips? If your tinsel does, in fact, get trapped in your garage’s moving parts, know that the jolly professionals at Overhead Door are available to help!